I stumbled upon this postcard from a friend’s artifacts and thought I would make it available. 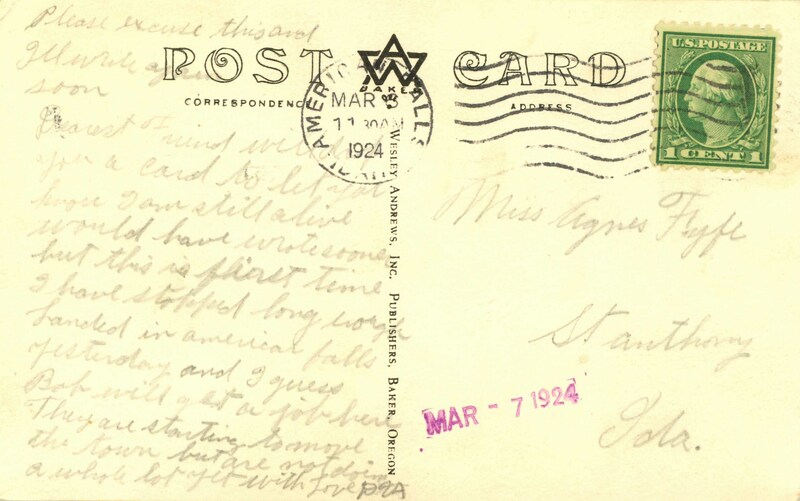 This post card was written and mailed 11 March 1924. 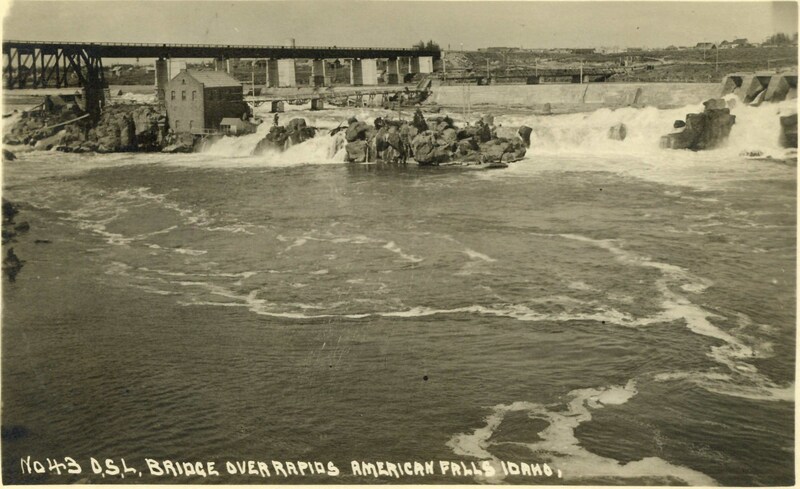 The thing I found interesting about the photo is that I had always understood that when the original American Falls Dam was completed in 1926, that it was the first dam on the Snake River in the area. Looking closer at the photo, you can see that is not the case. There is the weir across the back of the picture likely for the power plant you can see in the picture in front of the train bridge (which is still there). You can also see the Oneida Milling and Elevator Company’s grain elevator in the background above the train bridge, which elevator today stands completely surrounded by water. The current water level is somewhere near the height of the train bridge in the picture. The power house and weir are also still there today but both have seriously deteriorated since this picture. The rest of the town you can see in the picture was moved up the hill so as to not be flooded. The postcard mentions the move of the town before the completion of the dam. The other thing that is curious is the date stamp for the 7th, which means this letter was likely mailed on the 7th (Friday) at some other location and made its way to the formal post office in American Falls, Power, Idaho on the 11th (Tuesday) to be properly stamped. Where was this card mailed from, or is there another explanation? Some background on the sender and recipient of the postcard. Agnes Fyfe was born 25 April 1903 in Archer, Madison, Idaho and died 9 May 1994 in Rupert, Minidoka, Idaho. Dale Vern Ashcraft was born 19 February 1899 in Lagos, Caribou, Idaho and died 4 August 1975 in Rupert. These two lovebirds married 23 December of 1924, later the year from this postcard. Were they engaged by this point? Both of them were buried in the Hilltop Cemetery in Nyssa, Malheur, Oregon. The other interesting part of this postcard is it provides the handwriting of Mr. Ashcraft. This entry was tagged American Falls, Archer, Ashcraft, Fyfe, Idaho, Lagos, Nyssa, Oregon, Rupert, St Anthony. Bookmark the permalink.